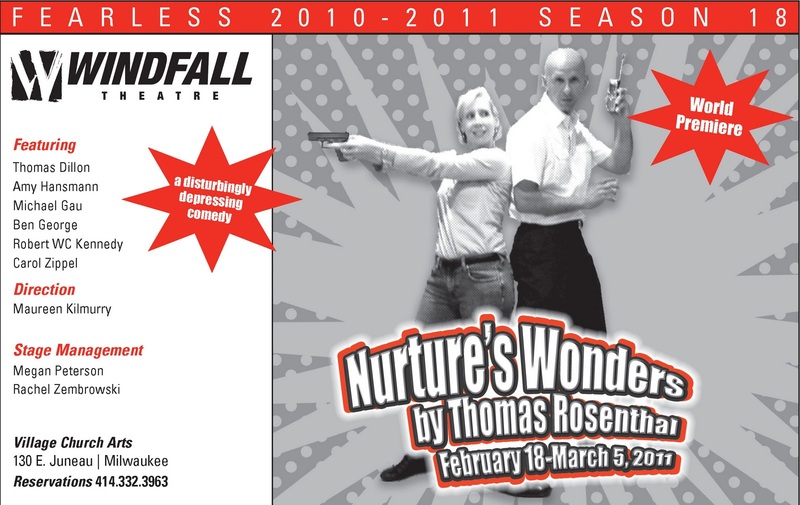 Windfall Theatre continues its all premiere 18th season of Fearless theatrical adventures with the world premiere of NURTURE’S WONDERS a disturbingly depressing comedy by Thomas Rosenthal staged in the company’s intimate performance space located at Village Church Arts, 130 East Juneau Avenue, in the heart of Milwaukee’s downtown theater district. About the play: Rosenthal’s NURTURE’S WONDERS a disturbingly depressing comedy for our times revolves around Marti & George Parker a typical American couple raising their children in South Fondy, USA until a mysterious young man named Marshall with ambitions of being a rap music star arrives in town on the same day that the school principal Hipple shows up at the Parker’s home with a gun found in their oldest son’s locker. Now Marti & George are determined to make sure their youngest son, Isaac, avoids the same fate so they try to find him a hero…even if all he really needs is a parent. NURTURE’S WONDERS contains adult language and content and its message is best suited to those 17 and over. It is a powerful and achingly current play. The show’s edgy comedy with unexpected pop culture twists and turns speaks to our troubling times. With headlines about gun violence and bullying in our schools riddling the news on nearly a daily basis and in the wake of the AZ shootings Rosenthal’s play will touch those who understand that the proliferation of guns is a detriment to our society and taking a tragic toll on our children’s safety, security, innocence and future. About the playwright: Windfall Theatre ensemble member Thomas Rosenthal has a Master’s degree in playwriting from Indiana State University. He came to Milwaukee as an acting intern at the Milwaukee Rep where he received playwriting consultation from award winning playwright Steven Dietz. 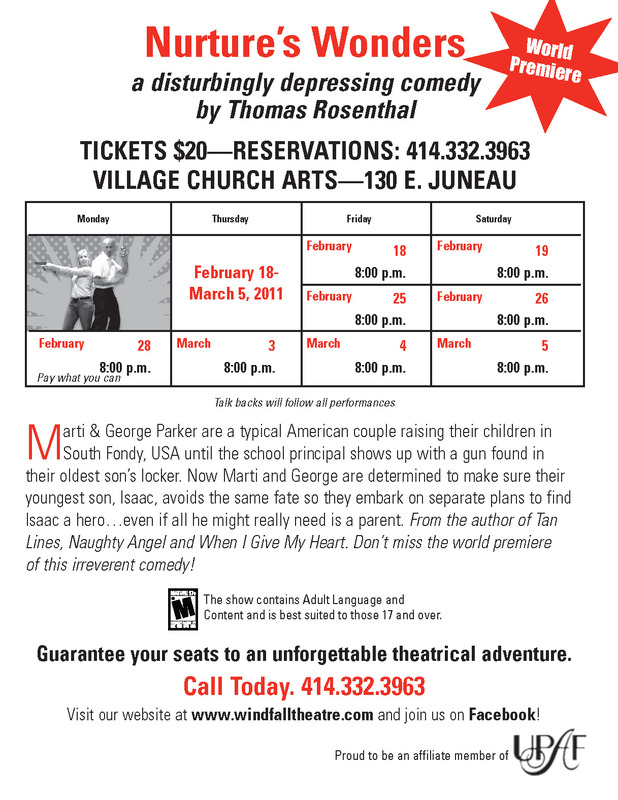 Windfall has produced three other critically acclaimed world premieres of Rosenthal’s scripts the comedies TAN LINES and NAUGHTY ANGEL and the love story mystery/drama WHEN I GIVE MY HEART. About the ensemble: Windfall has assembled a talented ensemble of Milwaukee theatre artists to weave this irreverent comedy’s prescient and too timely tale: Amy Hansmann (Marti Parker), Robert W.C. Kennedy (George Parker), Michael Gau (Marshall), Ben George (Hipple), Thomas Dillon (Sarge) and Carol Zippel (Yvonne). 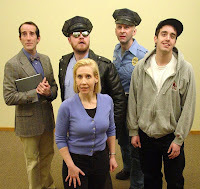 Maureen Kilmurry artist in residence and guest lecturer at Marquette University directs.